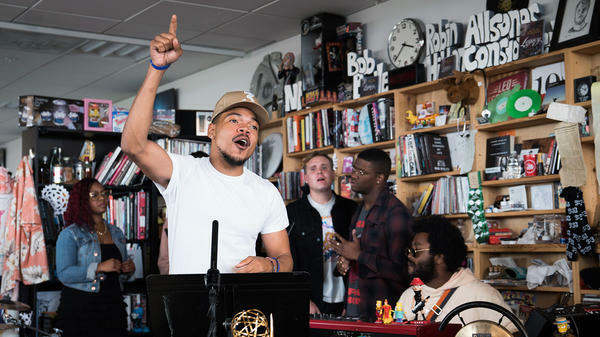 One of the living greats, Chance the Rapper, recently rendered a Tiny Desk Concert on NPR. Funny, given his standard shows these days in front of 20,000+ people. Watch below as Chance performs his own Juke Jam, recites his poignant new poem The Other Side and delivers a stunning cover of Stevie Wonder’s They Won’t Go When I Go (“for somebody close to me who just lost somebody close to them”). Chance is backed by Social Experiment members Nico Segal (trumpet), Peter Wilkins (keys), Rachele Robinson (background vocals), Ben Lusher (background vocals), Elliot Skinner (background vocals), Richard Saunders (background vocals) and Greg Landfair Jr., aka “Stix” (drums). They Won’t Go When I Go, is worth the price of admission alone, with Chance looking skyward, the ensemble rolling inspirationally, and Wonder’s worthy words: “And I’ll go where I’ve longed, to go so long, away from tears, and they won’t go where I go.” Amen.